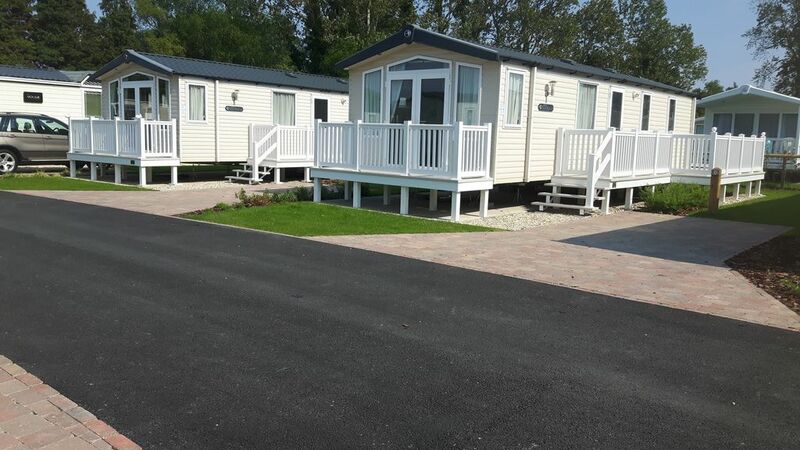 At 34 Sunset View, Rockley Park Poole, we have a Swift Bordeaux mobile home with patio doors, decked patio and large side patio which is truly stunning. It has two good sized bedrooms, a fully fitted kitchen with all the essential equipment, a good sized lounge with fireplace and 32" Colour TV / DVD, a separate full size dining table and chairs, mains water, electric and gas, central heating, double glazing and patio doors leading out onto a lovely patio where you can sit, relax and wind down before turning in for the night. You have your own private blocked paved parking area for 1 car, (a second car could parked carefully if not obstructing the road) right alongside your holiday home where it is situated in a brand new area of the 5* Haven Rockley Park Holiday Park in Poole in a private cul de sac, so no through traffic and are on level ground, nice and close to all the amenities! A very special location! When you collect your keys from reception remember to purchase your Funworks Pass for the duration of your stay, during the specific peak dates only we will cover the cost of the funworks passes - please ask for details when booking. 'Check out' is by 10 am to facilitate cleaning in readiness for the next guests. Having moved to the fabulous Dorset coast over 20 yrs ago, we live locally to the 5* Haven Holiday park which is situated within a short distance of the prestigious Sandbanks Peninsula with it's amazing Blue Flag beaches and celebrity 'locals' and the latest Rick Stein restaurant opposite the beach car park. We also own the Driven By You Driving School, Bournemouth & Poole. These mobile homes are immaculate and amazing. They offer a fabulous homely environment with double glazing, central heating and all mains utilities. With good sized decking, your own private parking space and situated in a private cul-de-sac on level ground close to the amenities, it's perfect! The site has absolutely everything you need and would expect from a 5* holiday park and even a local bus service comes on site so if you don't have a car you can still go on an adventure!! Private block paved parking for one car plus space for additional car if necessary. Front Balcony plus secure side decking area with gate. we had a lovely time with lovely weather! Very clean and comfortable place to stay. We found it warm at nights when the sun set. We had a short break in the mobile during October. Easy to find with lots of local amenities. The mobile is well equipped with everything you would need. It would have been 5 stars if the matteress's on the single beds were more suited to adults. We could feel the springs in our bums! Probably ok for kids though. Would use again if that one small matter could be addressed. very clean. Manual required for boiler as had to refer to internet for setting. Mattresses bit uncomfortable, could feel springs. Hi Jenny, thank you for the feedback. The boilers are pre set but yes they are a little complicated if setting specific times to come on / go off. As you felt the mattress was a little uncomfortable I replaced it today before the next guests arrived so thank you so much for letting me know enabling me to deal with that immediately. Thank you Tony hope we can help next year. We stayed in Karen's van for 5 days and a lovely break away. The caravan is very basic inside but had all the things we needed. Handy to have the balcony outside too for a spot of reading etc. The site is a lovely site, very family and dog friendly with lots to do just a walk away. The caravan is well situated and close to all the pools, spa, restaurants and entertainment with a few mins walk. Surprised we had to take all our own bedding as well as towels (given the small sized bunk beds) but it wasn't a problem - just remember you have to make all the beds before the evening! We'd happily visit and stay again another time. Hi Hayley, glad you had a good time. I have re visited the bedding situation and decided to now include linen at no extra cost for 2019 onwards, and supplied by Rockley Park. Whether you love cove hopping, fossil hunting, local shrimps or lively beach resorts, it’s all here, and very distinctively Dorset. A stunning stretch of sheltered southern coastline that harbours everything from smart marinas and watersports to awesome cliffs and outstanding attractions. Along the Jurassic coastline to the west you will come across Corfe Castle whilst heading eastwards you'll come to the New Forest, famous for it's natural beauty, free to roam ponies and vast areas to either cycle around or walk, amazing.